My kitchen is on the side of the house that faces the NeighborWithCameras. Several of their security cameras point right at my yard. I’ve talked about these folks before. I believe they amuse themselves at night, with a glass of wine, playing back their security video of me doing the crazy things I do in my garden: like chasing lizards and butterflies around with my camera phone; battling the leaves that are constantly invading the pool; climbing the ladder, long pole in hand, to cut fruit from the trees; meticulously pruning and primping the plants. My NeighborWithCameras don’t have any fruit trees or edibles in their yard so they don’t understand my mania. 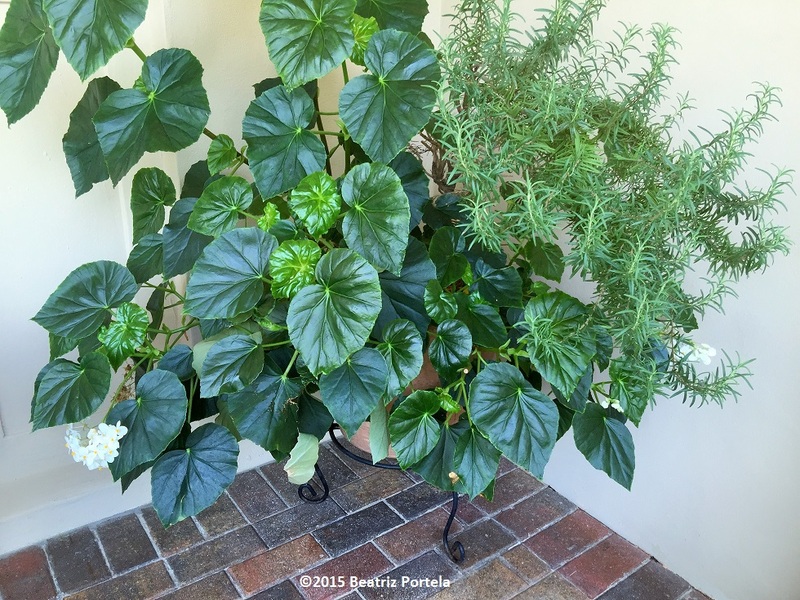 I’ve been nurturing the Clusia hedge –which separates our yards- watering it regularly and fertilizing it. I might take better care of it than my fruit trees, actually. Looking out of my kitchen window, I can still see a little of the second story of the neighbor’s house and 2 or 3 of their cameras. In a few more months the Clusia will have reached sufficient height to cover the sight of their house completely. Yay! 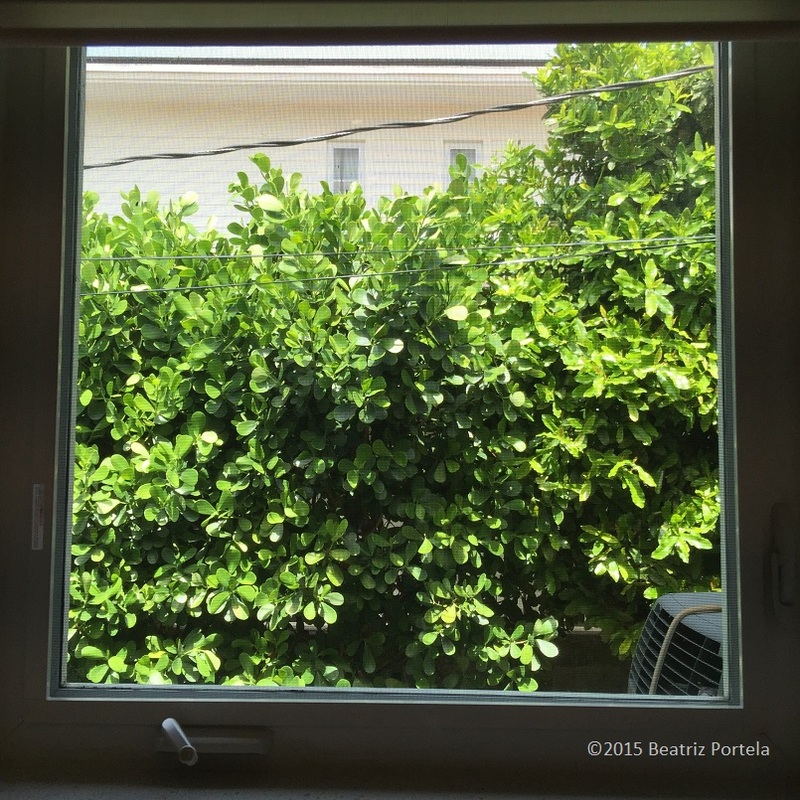 It’s not that I mind my NeighborWithCameras spying on me, it’s that I prefer to look at GREEN than at their house. Sorry, they’ll have to watch TV rather than me! There have been Gardenia plants around me much of my life. Dark shiny leaves… incredibly sweet fragrance… creamy white, smooth-as-satin petals… My parents had one when I was growing up. My grandparents had one. Friends have them. My next door neighbor has one planted alongside of my house. And my sister gave me this one as a house-warming present when I moved into my present home. 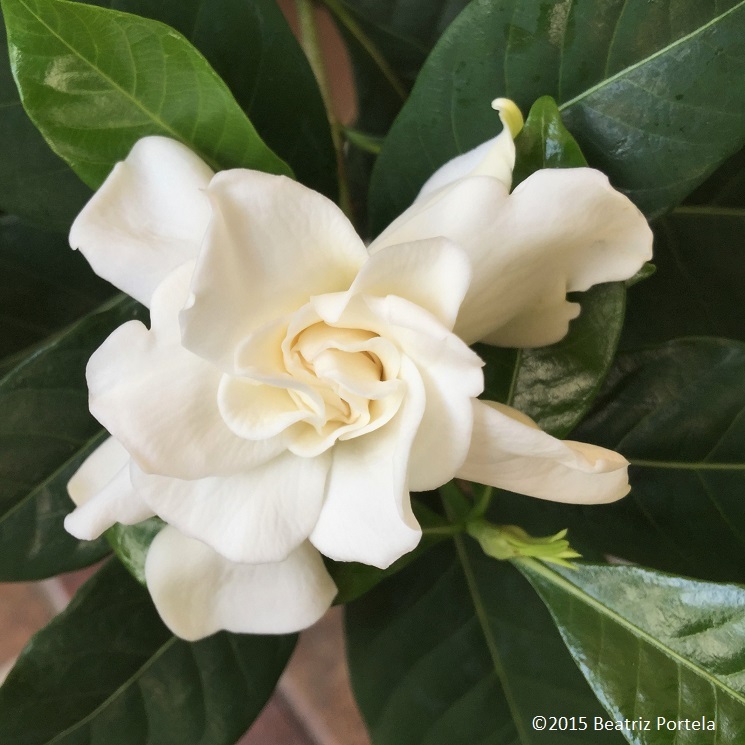 Gardenias are evergreen shrubs or small trees, also known as Cape Jasmine. Most people are familiar with the flowers’ strong sweet smell. They make an aromatic bouquet, hair ornament, corsage or boutonniere. The blossoms are also used as an ingredient in Korean mung bean jelly, called hwangpomuk; and the fruits are used in traditional Chinese medicine. 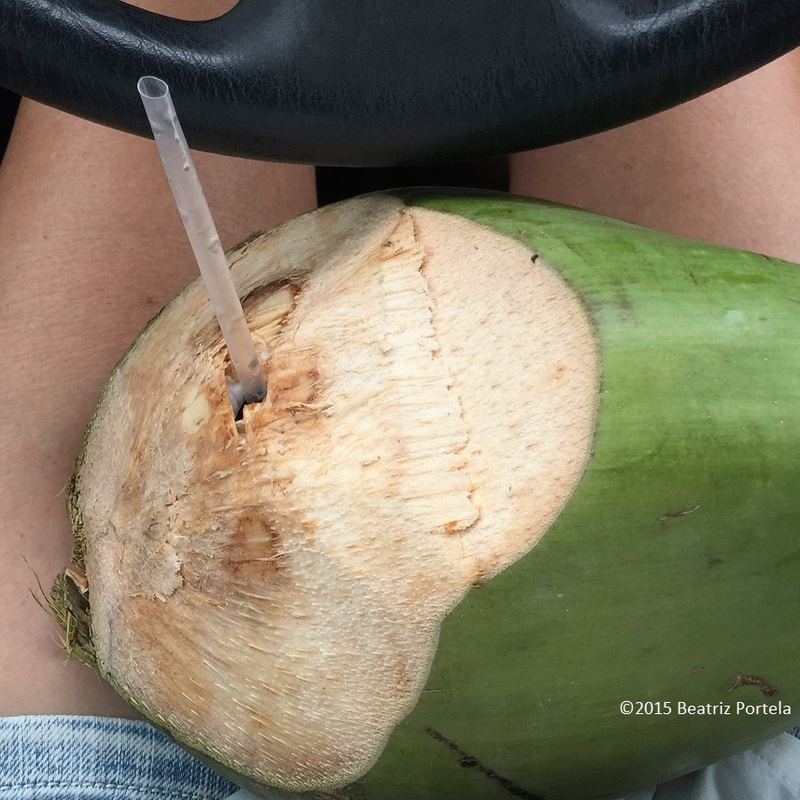 I had a craving for fresh Coconut Water today so I drove south to a fruit stand in Homestead and got this chilled coconut with a straw. Driving back home with it on my lap, and taking occasional sips between shifting gears, probably wasn’t the smartest thing to do. But it tasted so good… I need a longer straw! There’s something to be said for giving up on a sick or sad plant after you’ve tried everything and it is still giving you grief. 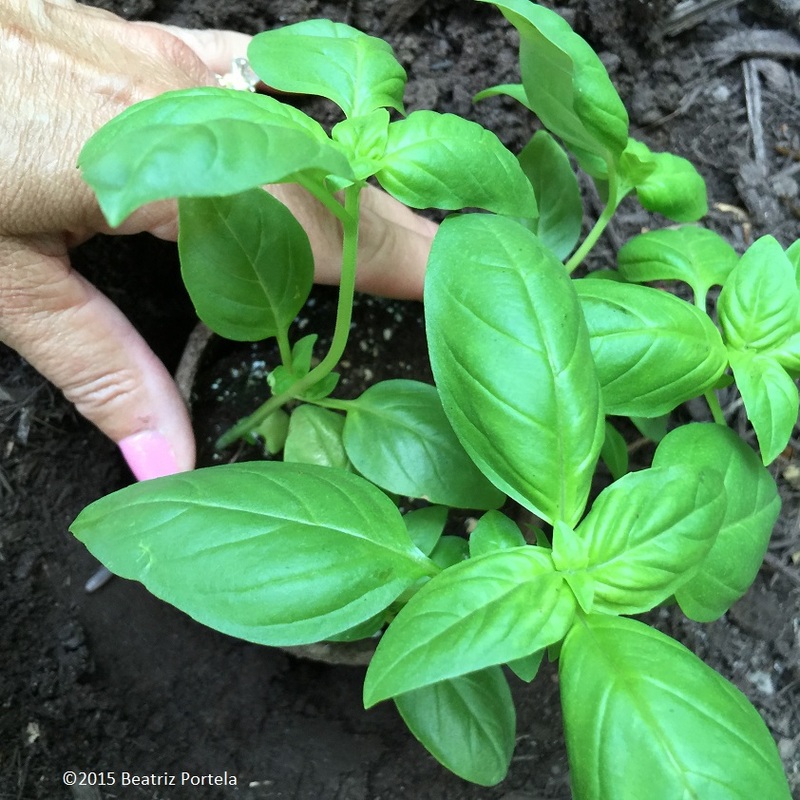 I had purchased a small Basil herb and transplanted it in a self-watering container. I made the mistake of giving it too much water, causing it to get a fungus, turn yellow and drop most of its leaves. I then tried to remedy the situation by placing it in the bright sun to dry out and watering it only sparingly. I waited patiently for the basil plant to recover to be able to cut off leaves for use in salads and on pasta. A week went by, then another, then another. After three weeks, it still looked yellow and very sad and had only grown back a few tiny leaves. I’m a big basil user and am used to having a robust plant I can harvest leaves from continuously, so this was rather distressing. When I was at the grocery store this morning I saw this beautiful Basil plant for sale, with large unblemished leaves, calling my name. SOLD! I’m happy to have healthy basil in my garden again. My old basil plant is still in a coma, in intensive care. Perhaps it will recuperate. If it doesn’t, I give-up. This guy, hanging out on one of my palm trees, is welcome in my yard. Lizards eat insects primarily and we have plenty of those in South Florida, especially mosquitos in the summer. So any help in ridding my garden of blood-sucking mosquitos is appreciated. If Mr./Ms. Lizard would like a present, like a bouquet of flowers perhaps, I would give him one. But what he really wants is for me to get the camera phone out of his face so he can get back to the business of mosquito-hunting; so I happily oblige. 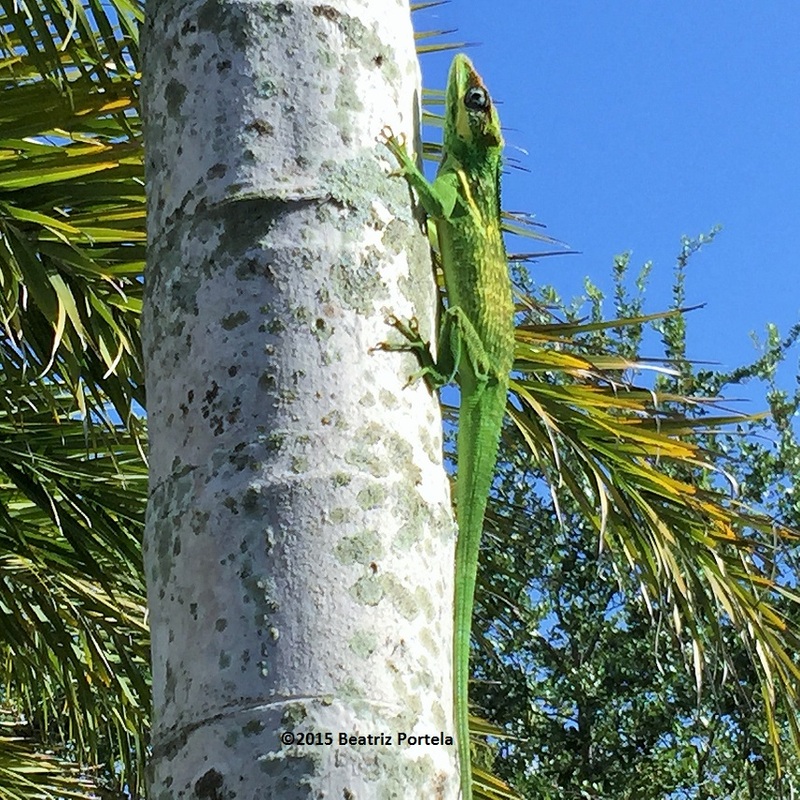 He’s a Knight Anole (Anolis Equestris), which were introduced from Cuba. These lizards also eat other lizards (sad) and even small birds (sadder). I do think there are enough mosquitos & other insects here to keep him happy though, so he won’t need to resort to cannibalism or bird homicide. I have other types of lizards in my yard and think most of them are cute, like this one. Yay lizards! I came across this peacock doing his mating dance on my morning bike ride in Crandon Park on Key Biscayne. I had to get off my bike to take a picture of it, then I decided to video him on my cell phone. In case you missed it, there’s an iguana in the grass watching the show on the left corner of the frame. Peacocks are in the pheasant family. They are ground foragers and eat insects; plants; and little creatures like reptiles, amphibians and small mammals. Isn’t it funny how the playthings you had as a child end up in your life later on…in some sort of iteration? One of my favorites of yesteryear was a little red wagon. I used to pull it around the house and outside, with my other preferred toys in it: a stuffed animal and a book or two. One of my stuffed animals was Big Bird. Remember him: the big talking yellow bird from Sesame Street? I would entertain myself for hours with those three things…making up tales about the stuffed animal and touring it around the block, and reading stories in the books that would transport me well beyond the neighborhood. Now I have a little gardening cart that I pull around the yard, full of my gardening toys, I mean tools! 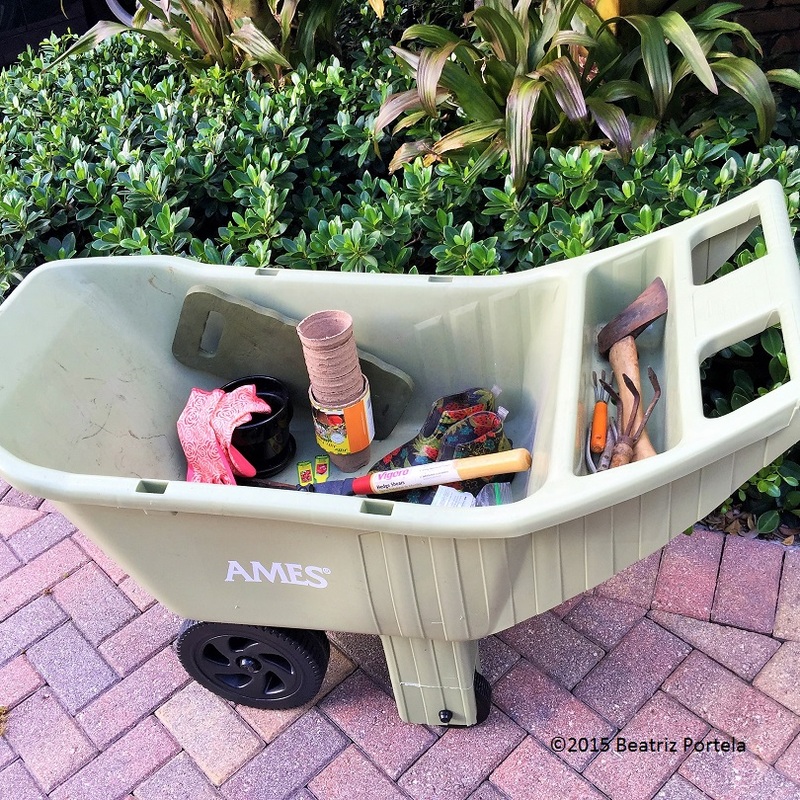 I spend hours outside with that plastic barrow accompanying me on my planting & maintenance rounds. I enjoy the chatter of the wild birds in the yard and of the green Macaw that lives in my house: Marco. He’s a good parrot and he loves when I play with him and talk to him. Books? I have many and am always buying more. They still transport me to other worlds. This story is in response to The Daily Post’s writing prompt: “Toy Story.” Do you have any new versions of old toys from your childhood? 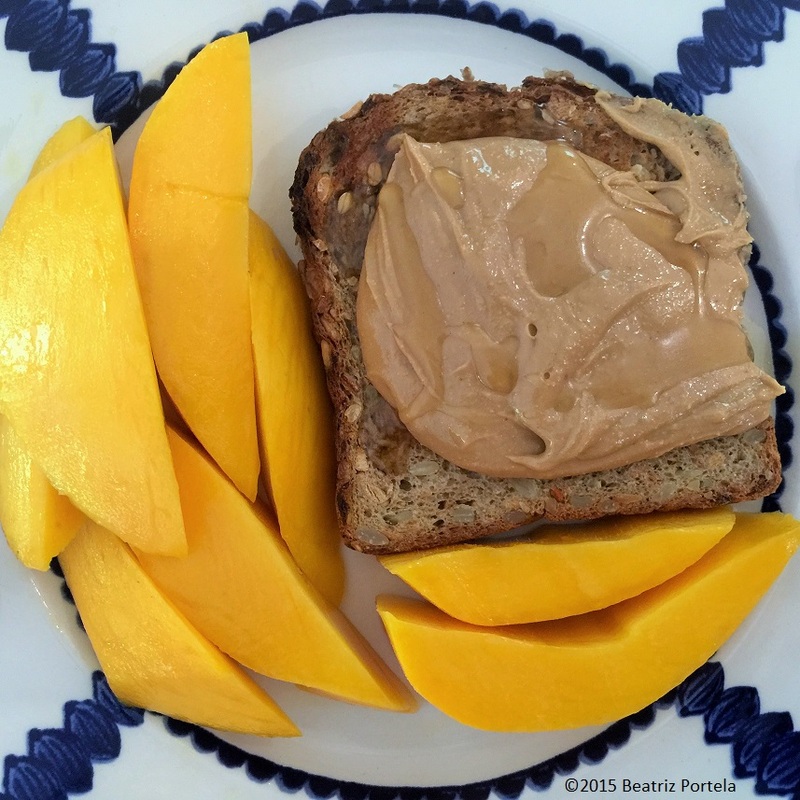 I started my day with cashew butter on high protein bread, with a little organic raw honey, and fresh sliced mango from my tree. The bread contains whole wheat, rye & soy flours; sunflower, sesame & pumpkin seeds; rolled oats; and dried carrots, banana & apples. The creamy cashew butter is non-hydrogenated, of course. This is a nutritious, easily-prepared meal. I was a young girl. It was a hot day. My dad, in his bathing suit, went outside with the fruit cutter to slice some mangos off the tree. 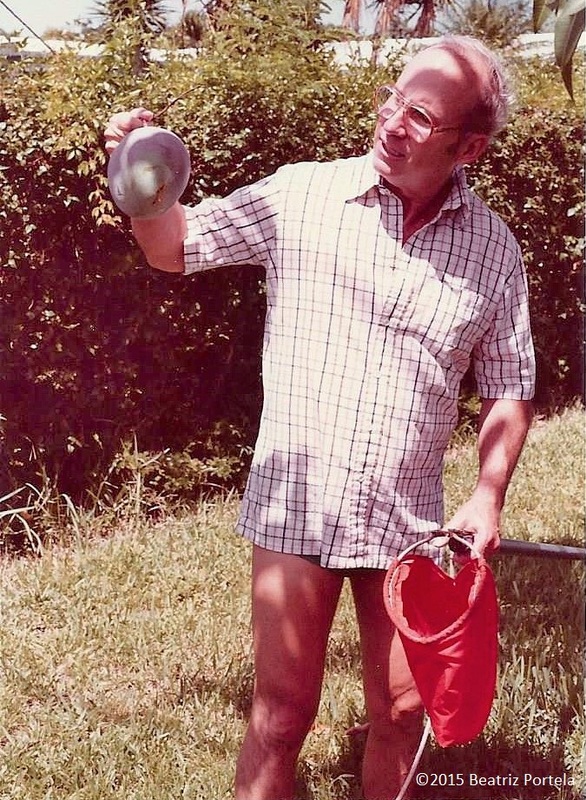 I followed him, like I often would, to take the fruit out of the red bag it would drop into once he cut it off the tree and lowered the pole for me. It was a sort of ritual we had, to collect the ripe fruit from the tree. I don’t remember anyone else in the family using that pole but him. And I haven’t been able to find a cutter similar to the one he used. I was 16 years old. My brother was home from college with some friends, swimming in the pool. I thought one of them was really cute so I walked outside (in my most alluring manner) to pick a mango from the tree which was behind the pool, in the hope that he would notice me. He did see me and we got into a conversation about the fruit. He had never eaten a mango and asked me if you ate the peel. I thought that was hysterical that he didn’t know how to eat a mango. I was in my 30’s, living in a townhouse, with no fruit trees. 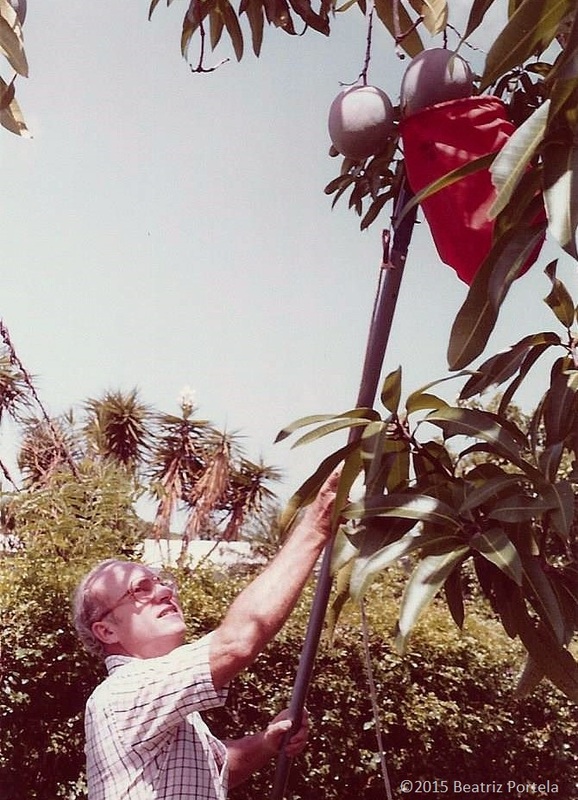 My grandmother Celia had a huge mango tree in her back yard. Those mangos were particularly tasty. When she was in the nursing center I mentioned to my mom that I was going over to Grandma’s house to pick some mangos. My mom was so worried that I was going to get electrocuted by hitting the fruit picker against the overhead electrical wires that she secretly hired a gardener to go pick all the fruit off Grandma’s tree. When I got to the house there were 2 large receptacles brimming with colorful mangos in the back yard waiting for me. R.I.P. Dad and Grandma. I have my own trees now. I wish you could taste how good the mangos are.